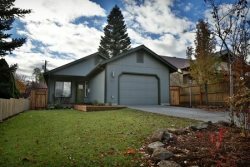 Gorgeous Bend Oregon Vacation Rental which sleeps 8 very comfortably, 2,400 sq. ft. with four bedrooms, three and half bathrooms, air conditioning and a tankless water heater. Beautifully furnished with modern decor and a whimsical flare with high end finishes, this vacation home is a one of a kind. Steps to downtown for all that you desire to do in Bend Oregon. In the main vacation house, which sleeps 6 with three bedrooms and two half bathrooms, two kings and a queen room, all with memory foam as well as ceiling fans and LCD's in each bedroom and hardwood floors on the lower level, carpeted upper level. Spacious fully equipped kitchen, with granite counter tops, gas stove with five burners and a gas oven, breakfast bar for four, formal dining for 10, opens up to the living room with a fireplace, a 50" CURVE Hi Def LCD with Onkyo receiver, sectional sofa and sitting chair. Washer and dryer in the main home as well as in the Awbrey Suite. The outdoor patio is actually a very useable and comfortable outdoor living space, just as gorgeous as the home itself, with beautifully manicured gardens and landscaping, a natural gas fire pit and barbeque, two umbrellas, two lounging chairs, and seated outdoor dining for 10, and a Jacuzzi brand therapy hot tub as well. You can hear the river spillway from the patio and the Awbrey Suite. Just steps away from the main home is the private 550 sq. ft. Awbrey Suite, which is furnished with contemporary decor, is a private fourth bedroom and bathroom, its own fully equipped kitchen, cafe table and chairs for two, living room with gas freestanding fireplace and 48" LCD with Blu Ray DVD, ceiling fan. The queen guest room has an LCD and a ceiling gan as well. An additional washer and dryer completes this unit as completely and fully equipped in every way possible. Parking available in the two car garage and a third space on the driveway or in front of the vacation rental. Play ping pong with your family and friends while creating amazing memories while visiting Bend, Oregon. For an extensive and definitive amenity listing, please scroll down the page. Sorry, No pets or smoking of any kind allowed. Formerly VRBO #473136 NEW OWNERS!